The Scotch 80s is the hippest spot in Vegas to live these days, but this neighborhood is no flash in the pan. 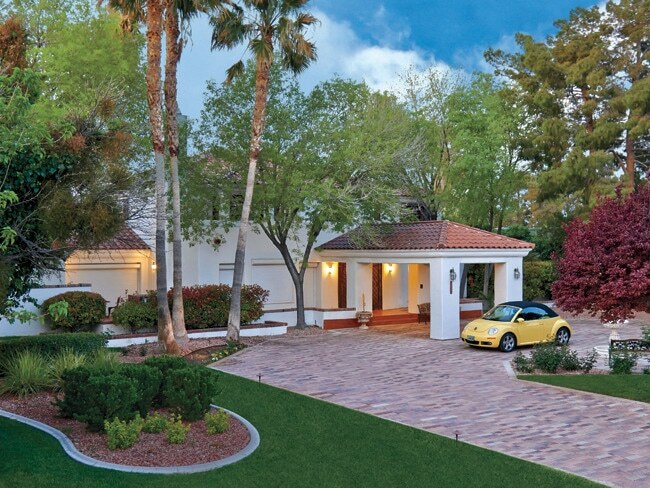 A home in the Scotch 80s, where many of Las Vegas’s young movers and shakers are moving. For a neighborhood that’s long attracted casino titans, world-famous entertainers, and prominent Vegas power brokers, the Scotch 80s is remarkably quaint. Howard Hughes and Steve Wynn lived here, and Jerry Lewis, Oscar Goodman, and State Senator Tick Segerblom still do. A new generation of Las Vegas players has also found homes in the area: The Killers frontman Brandon Flowers (in the former Howard Hughes residence), actor Nicolas Cage, news anchor Denise Valdez, and Electric Daisy Carnival founder Pasquale Rotella and his wife, entertainer Holly Madison. And, sources say, it’s become the neighborhood of choice for Downtown moguls and trailblazers, including Zappos boss Tony Hsieh, who purchased a home on Shadow Lane, and Life Is Beautiful festival creator Rehan Choudhry. “It’s the young, hip Vegas,” says Michael McGraw, a neighborhood resident and real estate broker who oversees sales for The Agency Nevada (theagencyre.com). But despite all the flash and cash, the neighborhood, just west of the I-15 and minutes from Downtown, has what residents like to call a small-town feel. “This is a place where you walk your dogs and ride bikes with your kids and wave to your neighbors,” McGraw says. “We’re all friends. We have each other’s e-mails.” In 2005, McGraw moved into a Scotch 80s house previously owned by the Duckworth family, investors in Vegas casinos, including the Dunes Hotel, and he has done about 10 real estate deals in the area—which is a lot, given that many of its houses have been owned by the same families for decades. A planned community that dates back to the 1950s, the Scotch 80s is known for ornate architecture featuring gigantic exposed beams and gracious porte cocheres. It’s also noted for the greenery on charming streets like Shadow Lane, Silver Avenue, and Bannie Avenue. It’s a place where people used to keep horses in barns and get water from wells. “We have single-story, half-acre residences,” says mystery writer Stephen Grogan, who has lived in Wynn’s former home for more than a decade. “We have grass and trees.” Enough grass, in fact, that World Series of Poker bracelet winner Phil Tom holds the annual Lakeshore Open Golf Tournament (essentially a chipping and putting contest for charity) in his yard. The dining room at 1801 Silver Avenue. 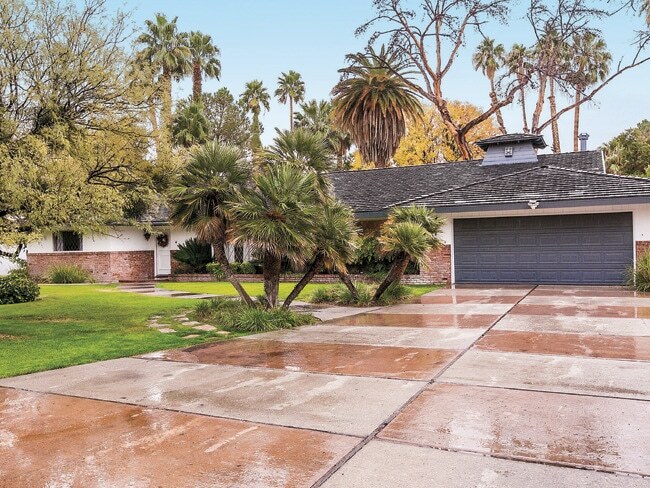 Another selling point of the Scotch 80s is its cost compared with pricey areas like Summerlin, where houses can sell for upwards of $300 per square foot. McGraw recently sold a home on Silver Avenue for $189 per square foot (and has two more listings at the same valuation), the top price in the neighborhood. He has handled several other Scotch 80s properties this year—including 2120 Silver Avenue (listed for $921,000) and 1800 Silver Avenue (listed for $841,000)—in a community where inventory has historically been low. Grogan, who runs an organization that battles commercial encroachments in the Scotch 80s, notes that many residents are committing to the neighborhood by renovating their longtime homes. 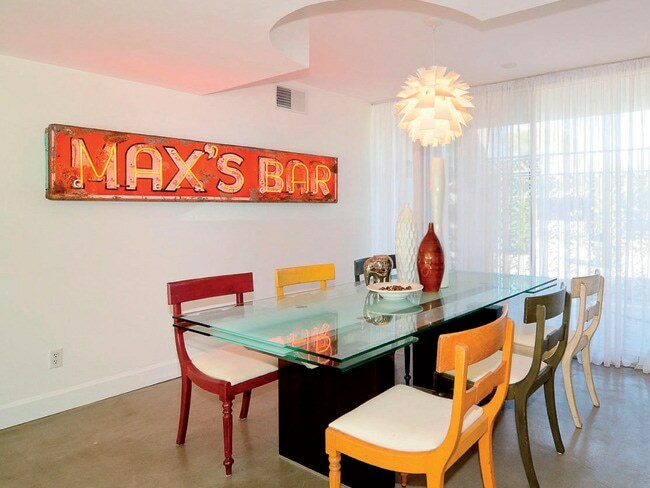 Broker Kenneth Lowman of Luxury Homes of Las Vegas, for example, says 1700 Bannie Avenue, which he’s listing for $960,000, “has been completely remodeled on the inside while keeping the period Midcentury Modern architecture that is common in the Scotch 80s.” Newcomers, drawn by the buildings’ great bones, have been renovating as well. The neighborhood attracts “people who don’t want cookie-cutter homes,” says broker Carlos Caipa of Prudential Americana Group. Caipa’s recent listings have included the house at 1919 Waldman Avenue, built and owned by Caesars Palace contractor R.C. Johnson. But it’s the mix of old-school living and new-school amenities nearby that really makes this a neighborhood with a bright future. Real estate is all about location, and that’s a Scotch 80s attraction that’s only becoming more attractive. The four-bedroom, 4,000-square-foot home at 1919 Waldman Avenue sold recently for $450,000.